This salad made me think of a silly riddle that I read many years ago. It was one of three or four riddles that were in a little book inside a box of Cracker Jack’s. For some reason, I still remember it. Here’s the riddle. Question: How did the farmer pay his bills? I heard that groan, but it’s OK. The riddle is pretty bad, isn’t it? My mother claimed that I referred to Celery as Celery/Salary for weeks after. I don’t think I fully understood the riddle when I read it which is probably why I kept saying Celery/Salary. Maybe I just liked the rhyming sound. I don’t know. Anyway, as I was slicing up my celery and thinking about nothing in particular, Celery/Salary popped into my head, and I remembered the riddle and decided that I would share it here. I am always looking for new and interesting salads as the days begin to get warmer. I am also always looking for salads that can be made ahead and that hold up well in the refrigerator. These types of salad make it much easier for me to quickly pack a healthy lunch in the morning before I head off to work. They also make great accompaniments for grilled meats. This salad is modified from a recipe that I read in one of those Magazine/Cookbooks that are on display near the cash registers at my local grocery store. I was leafing through it, trying to decide if I wanted to buy it, while standing in a very long, and slow moving, line. Does anyone else always find themselves in the line that suddenly stops at the grocery store? It happens to me all of the time. Back to the inspiration for this recipe. Though I didn’t buy the book ($9.99 for a magazine? Are you kidding me? ), the salad looked interesting and between what was in my cart and what I had at home on my shelves, I had almost everything that I needed to recreate the recipe at home with a couple of modifications. When I got home, I whipped up the salad, and after tasting it to make sure that it would pass muster, I stuck it in the fridge to go with that night’s dinner. The salad was a success, and the leftovers were great the next day with my lunch. I liked it so much, that I kept making it over and over until I was completely out of celery. That has never happened before. What will you need to make this recipe? This recipe is very easy. The greatest part of the prep time is spent slicing the mushrooms and the celery, and that’s not really all that hard. I must confess, though, that I have been known to use pre-sliced mushrooms which I actually cut into smaller pieces so that they were similar in size to the celery. It tastes the same however I slice the mushrooms, but I think it looks prettier when I slice them myself because I can slice them very thin and they can retain their mushroom shape better than when I cut the thicker, commercial prepared, slices into pieces. I really liked this recipe, and I plan on it becoming one of our regular summer sides. It’s light and refreshing. 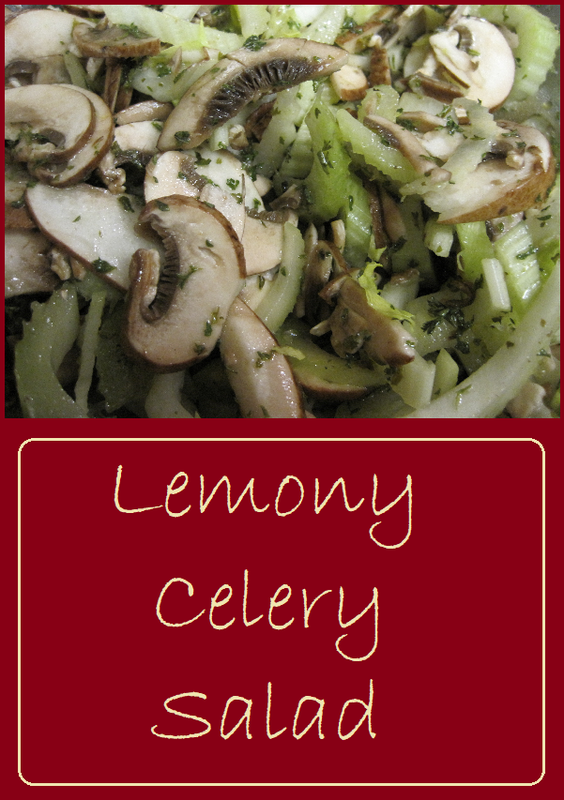 Give our recipe for Lemony Celery Salad a try and let us know what you think by leaving a comment below. This is a light and refreshing summer salad that's something different. It's great as an accompaniment to barbecued meats, and it's delicious on it's own. It's also very inexpensive. This salad serves 6 for only $4.58 or about $0.77 cents per serving. For a vegan version, leave out the cheese. The salad is still delicious. Make the Lemon-Parsley Vinaigrette by mixing the olive oil, white wine vinegar, lemon juice, parsley, and salt together in a jar with a lid. Mix together by shaking sealed jar until thoroughly combined and set aside. Shake up the Lemon Parsley Vinaigrette again. You may top each serving with cheese if desired. It tastes good either way. Nutrition Information is for 1/6th of the recipe prepared according to the recipe above. This is approximately a one cup serving. Disclaimer: Nutritional information is calculated using online tools such as those available at cronometer.com or verywellfit.com. We make every attempt to ensure that this information is calculated correctly, but this information should be considered estimates. Varying factors such as product types or brands purchased, natural fluctuations in fresh produce, and the way ingredients are processed change the effective nutritional information in any given recipe. In addition, different online calculators provide different results depending on their own nutrition-fact sources, databases and the algorithms used. You are solely responsible for ensuring that any nutritional information provided is accurate, complete, and useful. Under no circumstances will PattyCakesPantry.com be responsible for any loss or damage resulting for your reliance on nutritional information. I am not a fan of celery, hardly use it, mostly to make a mirepoix. But this salad looks nice and fresh and love that is lemony. I could try it and maybe like it too! Nicoletta, a mirepoix is my most frequent use for celery, too. It’s closely followed by adding it to tuna or chicken salad. This salad was a departure from our usual use of this refrigerator staple. The ingredient list looks lovely and with just 123 kcal, this is a really light and summery dish! You’re right, Kiki. This salad is very light and refreshing. It’s perfect for days like today. It was 105 degrees here, today. I love mushrooms. This dish with “salary” is something I would like to try because I am on the lookout for nushroom recipes. This sounds yummy! Rosanna, I love mushrooms, too. I never had them as a child because my mother was allergic to them, but now that I’m an adult, I buy then all of the time. Give our “salary” salad a try and let us know what you think. I have never seen a salad like this! I need to show it to my husband because he loves mushrooms and celery! I hope you make it for him. He will love it. It’s perfect for this time of year. I feel you with always standing in the wrong line at the supermarket! 🙂 and this salad looks delicious, great combo of flavours and ingredients! I’m glad I’m not the only one who gets in the line at the store that slows and stalls. I really hope you try this salad. It’s simple, and it’s great for this time of year because the celery is so refreshing. No matter what line I get into at the store, it ALWAYS becomes the slowest…that’s why I’m so glad my grocery store has self checkout! My dad says it puts people out of work. I tell him it makes my life easier 🙂 This looks like the perfect side dish for the summer! Light and refreshing. Karyl, you’re right about the self checkout, but at my store, you have to have 15 items or less. I try to only shop once a week, so there’s usually more than 15 items in my cart. You should definitely try this salad. It really is refreshing. 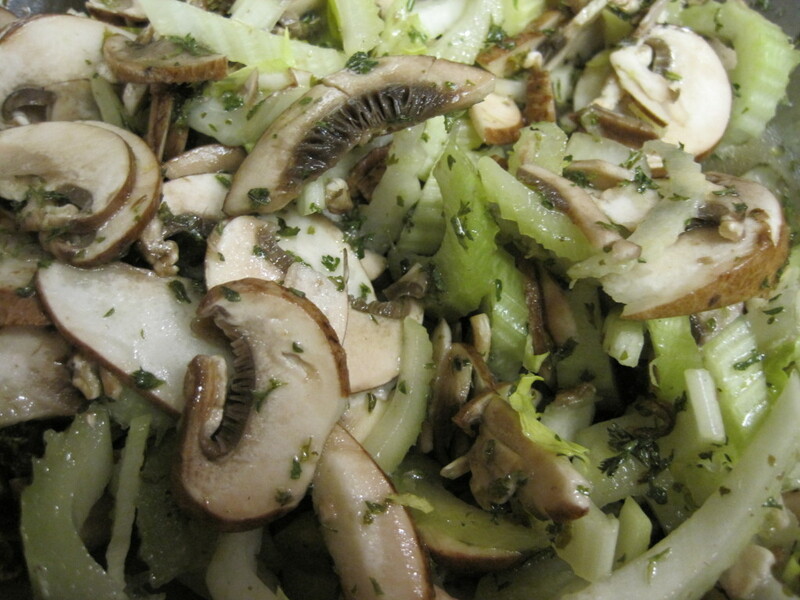 This is such an interesting combination – I’ve never tried a celery and mushroom salad before. But I love both, so I can’t wait to give this a try! Julie, I really hope you give this a try. We love it. It’s so simple and, for such a simple recipe, it’s surprisingly delicious. Hahaha! I love that story! Each year for Christmas eve we open “Christmas crackers” which always have a corny joke inside. We LIVE for those bad jokes! Kitty, I’m glad you appreciated my corny riddle. We had “Christmas crackers” for the first time last year. They were fun. I have a graduation party next week and I’ve been searching for the perfect side dish to bring that no one has tried. Can’t wait to share this potluck dish with family and friends! This recipe is so simple, but so tasty. Let me know how well it’s received at the party. This really is the perfect side dish for this time of year. The kids and I love celery (hubby not so much) but this may tempt him as he adores mushrooms!! Claire, give it a try. Maybe he won’t realize it’s celery. In my house, if a majority of people like things, then we still serve them. It sounds like he’s outnumbered on this one. What a refreshing salad! I love what kind of crunch this is going to have each bite! Kelsey, I really hope that you give this salad a try. It’s really refreshing and, as you pointed out, it has a great crunch. You make really good healthy stuff! This is perfect for keto dieters! Nicole, I didn’t realize it was good for keto dieters. I will have to add that to my tags. Thanks for the heads up. All I knew was that this salad was simple to prepare and delicious.